For over a decade, B-Air® has been answering the needs of the animal and agriculture industries by offering safe, durable dryers, fans, and dehumidifiers. 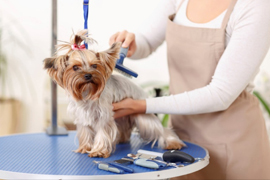 We offer top quality products for grooming salons, veterinarian facilities, kennels, home use, and large animal drying. Our innovative products are manufactured in our state-of-the-art facilities reflecting our continuing dedication to design, performance, and safety. B-Air® products are certified ETL and CE approved for use in the US, Canada, Europe, and South America. For over a decade, B-Air® has been answering the needs of the water damage restoration, carpet drying, and janitorial service industries by offering safe, durable air movers, fans, and dehumidifiers. We offer top quality products for use in water damage situations in both home and commercial buildings. Our air movers are designed for many applications including carpet and floor drying. Our innovative products are manufactured in our state-of-the-art facilities reflecting our continuing dedication to design, performance, and safety. B-Air® products are certified ETL and CE approved for use in the US, Canada, Europe, and South America. For almost two decades, B-Air® has developed and manufactured air movers, dryers, blowers, dehumidifiers and ventilators for commercial and retail use. B-Air® prides itself on creating the highest quality products to supply the needs of the ever changing and evolving industries it serves. B-Air products are designed and engineered in California ensuring attention to detail and the highest standard of quality. Leading the industry when it comes to the inflatable and pet industries, B-Air is positioned to become a market leader in the water damage restoration and janitorial industry having already become the go-to company for quality air movers, dehumidifiers, scrubbers, water damage restoration equipment and more. With accolades by reputable organizations, B-Air® continues to uphold its core objectives: to develop superior products with exceptional customer service. The Ventlo-25 is a low-profile air mover that delivers high-performance results. It is designed to bring convenient drying power to a jobsite with its stackability and transportability. This low-profile air mover features a durable housing construction, variable speed control, built-in kickstand, GFCI daisy chain capabilities, and a concentrated airflow. For over a decade, B-Air® has been answering the needs of the inflatable, advertising, and rental industries by offering safe, durable blowers. We offer top quality products for inflatable jumps and slides, advertising balloons and puppets, and rental & event companies. Our innovative products are manufactured in our state-of-the-art facilities reflecting our continuing dedication to design, performance, and safety. B-Air® products are certified ETL and CE approved for use in the US, Canada, Europe, and South America. When it comes to professional janitorial, inflatable, pet drying, and restoration equipment, no manufacturer surpasses the design, engineering quality and customer service that B-Air® is known for. With 20 years in business, we have dedicated ourselves to creating high-quality products delivered with excellent customer service. Serving customers in need of heavy duty equipment for their businesses and customers in need of reliable equipment for home use, B-Air® provides equipment to a variety of industries and businesses. As we continue to develop and expand our existing product lineup, we can keep providing cutting-edge equipment to the ever-evolving industries we are committed to serving. At the world-class B-Air® facilities located in Azusa, California, designers and engineers are dedicated to innovation and improvement in their creation of our restoration equipment, janitorial air movers, inflatable blowers, and commercial pet dryers. This is an effort to meet the company’s goal of continuously increasing standards of performance, quality and safety. When you choose B-Air® products for your mold remediation, janitorial/sanitation, water and fire damage restoration, or other commercial application, you can rest assured you’re getting the highest-quality equipment that gets the job done right every time. As one of the world’s best water damage restoration brands, we have the right equipment to help you and your team successfully complete your restoration and remediation projects. B-Air® is proud to carry innovative, high-quality products for the water damage restoration, janitorial/sanitation and pets and animal industries. Our inventory includes commercial air movers, LGR and conventional dehumidifiers, HEPA air scrubbers, inflatable blowers, and pet dryers. 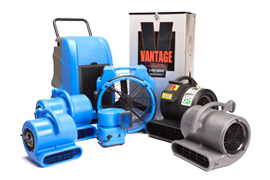 We offer an extensive inventory of flood damage and property restoration air movers to help with any job. B-Air® offers affordable air movers and commercial fans that are made to work as hard as you do. All B-Air® air movers are designed to meet rigorous standards of safety and durability. These air movers are meant to perform day in and day out so that you have equipment that you can rely on for every job you take on. Every piece of equipment is engineered with durable roto-molded plastic housing that protects the inner components from damage, even when being loaded and unloaded from your van or truck every day. B-Air® Vent VP-25 Compact Air Mover: A compact, three-speed ¼ horsepower that is stackable for easy storage and has daisy chain capabilities. B-Air® Vent VP-33 Air Mover: An air mover with a slightly larger, three-speed 1/3 horsepower motor, and three convenient positions for airflow. This unit is also stackable with daisy chain capabilities. B-Air® Vent VP-50 Air Mover: This air mover has a two-speed ½ horsepower motor, with a powerful airflow. It can be used at three convenient angles and easily stacked for storage. B-Air® Grizzly GP-1 Air Mover: This three-speed air mover has a ¼ motor. This powerful air mover can be used at four different angles. These models offer a variety of features combined to offer you whatever mix of power, portability, and storage capabilities you and your business require. All of these centrifugal models can be positioned at different angles to support better efficiency in any water damage restoration project. B-Air® Flex FX-1 Mini Air Mover: This small centrifugal air mover is small enough to fit in cabinets and under counters and still has a ¼ horsepower motor. It can be daisy chained up to four units. Our axial air mover model is the perfect choice if you need to maximize air volume with minimum horsepower. B-Air® Polar Bear PB-25: This axial air mover has a two-speed ¼ horsepower motor encased in durable rotomolded plastic housing. This unit is also stackable up to four units and daisy chain capable with GFCI. Almost all of our air movers are available in a variety of colors and can be ordered in custom colors with your private label on it to help you promote your company and easily identify your equipment. B-Air® water damage restoration dehumidifiers are designed to withstand commercial and industrial environments hit hard by floods or other natural disasters. These commercial dehumidifiers are encased in a roto-molded plastic housing and made from durable internal components that are the product of years of engineering innovation. B-Air® Vantage VG-1500: This commercial dehumidifier is designed for water damage restoration projects large and small. It can remove up to 76 pints per day (PPD) at AHAM. The B-Air® Vantage VG-1500 is also compact and maneuverable, making it useful in buildings requiring dehumidification in tight areas. B-Air® Vantage LGR 2200: The B-Air® Vantage LGR 2200 can remove up to 130 PPD at AHAM. LGR, or low-grain refrigerant, dehumidifiers are able to remove more moisture from the air than their conventional counterparts. These types of commercial dehumidifiers may be ideal for severely water damaged properties. Our high standards for durability and performance mean you can rest assured that every water damage restoration dehumidifier is built to withstand and endure your toughest restoration projects for years to come. By investing in B-Air® dehumidifiers for your professional needs, you’re investing in your business’s future. Nothing is a bigger priority than health and safety when it comes to all flood, water damage and natural disaster restoration and remediation projects. That’s why it’s vital to ensure your project is stocked with the best water and mold remediation equipment on the market. Air scrubbers are essential to any project that involves airborne contaminants, which could include fire damage restoration, mold remediation, or any water damage restoration project involving contaminated water. B-Air® Raptor 650 Air Scrubbers are designed as portable HEPA filtration systems. These high-performing air scrubbers draw in surrounding air from the surrounding environment. The Air is then passed through a three-part HEPA filtration system to remove airborne contaminants. The filtration technology removes particles like mold spores, dust, pet dander, drywall dust, pollen and other potentially dangerous debris. In fact, the Raptor 650 Air Scrubber can filter particles as small as 0.3 microns. To ensure a safe and effective job, the Raptor 650 Air Scrubber was designed with low amperage and daisy-chain connectivity. Its variable speeds allow users greater flexibility when it comes to different jobs with different needs. For those in search of \inflatable blowers and replacement bounce house blowers for inflatable rental and event planning businesses, B-Air® has the equipment you need. 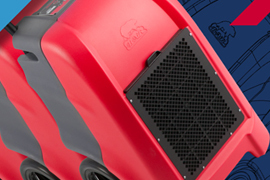 Safety and durability are what set our inflatable blowers apart. For high-efficiency and compact inflatable blowers, try our B-Air® Kodiak KP models of blowers, including the new Kodiak KP-1 ECO model. For more powerful inflatable blowers, we offer the Super Bear BP-2 and Koala KP models to help fit your needs for power and airflow, while also fitting the space that you have to work with. These can be used as air dancer blowers, as blowers for inflatable bounce houses, or for inflating advertising or decorative holiday blowups. Many of our customers buy these as replacement bounce house blowers and are pleasantly surprised by their power and durability. B-Air® is proud to provide the most reliable and trusted brand of commercial dog dryers, blowers and air movers. Whether you run a dog kennel or grooming business, veterinary facility, animal rescue or it’s just for home use, trust B-Air® for a full line of safe commercial pet dryers. Our professional dog hair dryers and air moving products include the B-Air® Bear Power BPD-1 and Bear Pro Series BPS-II. These high-quality dryers were specifically designed and built for dog and pet groomers. They’re lightweight, yet powerful and built to last. B-Air®’s reputation for producing high-quality professional pet drying products doesn’t end here. The Fido Max-1 Dog Dryer was created specifically to support the bond between pet and owner. These dog dryers are endorsed by Cesar Millan, world-renowned dog behaviorist, and he has provided a number of tips and tricks for drying your dog that you won’t want to miss. The Fido Max-1 is a lightweight, powerful and quiet professional dog hair drying tool. It was designed to be a safe and effective tool for professional groomers, veterinarians and pet owners alike to use on dogs of all sizes. The Fido Max-1 dries out the dog’s coat without overheating, burning or over-drying the animal’s hair and skin. B-Air® is headquartered in Azusa, California and distributes equipment throughout the world. Thanks to our international network of distributors, we can provide an extensive equipment lineup to multiple industries in several countries, all while meeting important quality and safety standards. All B-Air® equipment is designed and engineered in our high-tech California manufacturing facilities. Our equipment design standards focus on efficiency and performance to meet the needs of commercial and retail customers. All B-Air® air movers, dryers, blowers, dehumidifiers, and air scrubbers are developed and manufactured with the highest standards in quality. We believe in providing high-end products that represent our company’s standards for innovation and value. At B-Air®, adhering to and surpassing industry safety standards is one of our top priorities. This is part of our commitment to delivering quality products with an exceptional customer experience. All B-Air® products are certified by ETL (Edison Testing Laboratories) and CE (European Conformity), which are strict safety standards. This means they are authorized for safe use internationally in the United States, Canada, Europe and South America. We believe quality customer service should accompany quality products. Our knowledgeable reps can help you find the part or equipment that fits your needs and your business. Our technical support department is staffed by experts who understand products like air movers, dehumidifiers, blower and dryers. Tech Support can be reached by email or phone with support provided by our in-house parts department. For your convenience, we also offer an online resource center featuring all equipment user manuals available for quick and easy download. Our knowledgeable sales and technical experts are available to serve you Monday through Friday, 8am to 5pm PT. For two decades, water damage restoration professionals have trusted B-Air® to be their valued partner in supplying natural disaster restoration, flood drying and water damage repair equipment. Water damage restoration is a comprehensive and complex task that requires a full line of tools to tackle jobs of any scale. B-Air® offers a complete product lineup for these water damage repair jobs, and we pride ourselves on being the one-stop-shop for wholesale water damage restoration equipment. B-Air® is also dedicated to ongoing innovation and product development to adapt our product line to the changing needs of water and fire damage restoration professionals. Professionals providing mold remediation services place health, safety and performance as their highest priorities on each project. That’s why these professionals use B-Air® for their mold remediation equipment, including air movers, air scrubbers and dehumidifiers. Our products can help you successfully remove mold from any home or commercial project. Professional mold remediation companies are dedicated to restoring homes and businesses back to healthy living environments, and they trust B-Air® to help get them get the job done. B-Air® also offers a line of products that accommodate the needs of the janitorial and sanitation industry. Our air movers and floor drying fans are safe, effective, and made for long term use. Janitorial and sanitation industry professionals rely on B-Air® products for all their floor and carpet drying needs. We understand that each industry has its unique needs. 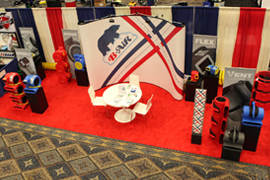 That’s why we developed a product line exclusively for the inflatables, advertising, and events planning sectors. Our safe and reliable inflatable blowers and fans are perfect for all bounce houses, blowup slides, air dancers, and other inflatable displays. Professionals from inflatables, advertising, and events planning businesses trust B-Air® products for their durability and portability, which are essential components required for success in this industry. Dedicated to bettering the bond between humans and animals, B-Air® is proud to offer a lineup of commercial dog dryers for professional and home use. Dog groomers, salons, kennels and veterinarians value the safe and reliable pet drying products B-Air® offers. With B-Air®’s Fido Max-1 dog dryer endorsed by Cesar Millan, pet owners and caretakers know that B-Air® is providing high-quality, carefully designed drying products that will protect animals and owners alike. With dozens of products serving multiple industries, it’s easy to see why so many professionals and homeowners trust us to be their partner. Our innovation and commitment to design have allowed us also to extend our products to serve the pets and animals as well as the inflatables industries. By partnering with B-Air® for all your pets, inflatables and wholesale water damage restoration equipment needs, you can take advantage of our bulk packs. B-Air® bulk buying options allow professionals to save money on their equipment orders. Check out our lineup of commercial dog dryers, inflatable blowers and restoration equipment for sale. Questions? Contact us online or by giving us a call. We’d be happy to hear from you, and even happier to help you find the perfect piece of equipment.